So the other day I wrote about how I decided to sign up for Ironman Boulder. And in that post I explained that trying to prepare for and get to Ironman Lake Tahoe was an exhausting experience, in part because I had to drive "halfway across the country." And you guys FREAKED THE HELL OUT in the comments and on Facebook and in emails to me. Because SLC to Tahoe is apparently NOT halfway across the country. And it is offensive to anyone who has ever driven halfway across the country that I made such a claim. Which got me thinking: I exaggerate an exceptional amount on Stranger. I think somewhere around 10% of what I say is literally true. And for the most part, everyone just rolls with it. But I finally found your breaking point. And that breaking point is overstating how far I had to drive to get somewhere. It is amazing the amount of crap Ms. Hannah Rose gets me to do. Matt swears he took this candid shot of Ollie RIGHT after telling him that he was going to come spend the day with me. Ollie hanging out on the couch with Rebecca. I frantically saved this bike, which Bob bought in 1967, from a certain death when I found out Bob and Cathie had planned to give it away. Hashtag hoarder. Yard work in Bob and Cathie's beautiful back yard. I carved pumpkins with Matt. Mine is NOT the one with the cat. Per your demands, I got a haircut--and the specific haircut that was suggested last week (Thanks Michelle and Dana!). 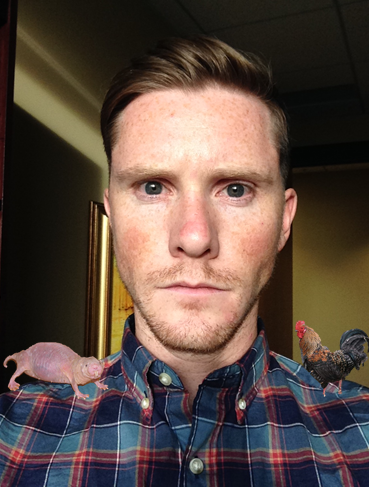 Also, I would like to name this picture "Shoulder Angels." Spotted by Becky in the SF Bay Area. The cat clutch! Thanks, Emilie. I'm glad I'm not the only one who was confused (until age 23 . . .). Thanks, Kaitlyn. Amazing response to a text scam. Thanks, Matt. The clowns terrorizing California. Thanks, Kimbally. And an article about how clowns became terrifying. Thanks, Paul. Kramer's 15 best ideas. Thanks, Jake. The most ridiculous fight scene ever filmed. Thanks, Chad. The ten worst horror films of all time. Thanks, Julie. The Bad Taxidermy link takes me to Gmail. Did you copy the wrong one? I've taken several of those pictures at Lagoon! They're awesome. I'd totally join you on this (hypothetically). Um. . . Just please don't make promises unless you intend to keep them. Please make a sign that says "YOUR HAIR LOOKS GREAT!" I believe you meant "shoulder demons". There's nothing angelic about those two. Eggs must be confusing to a lot of people... I had a friend in high school that SWORE eggs were made in factories. The Q of C and Beyonce are mortal enemies. But then again, everyone is a mortal enemy to the Q of C.
It's because she's hot Eli, that's how she gets you to do all those things with her. Are we allowed to stalk....I MEAN follow Miss Hannah? ....seriously though...she is so totally hot in that picture. I think actually it was probably Eli who convinced her that dressing up was a good idea. I think you're probably right. Anything to capture his hair in a picture. Notice he's not wearing a cowboy hat? That should have been my first clue. Stalking is not kosher. Also, I already tried it. Luckily for this particular Ms. Hannah Rose, she's not too easy to find on the internet. Add to that, we don't know if Rose is her last name or middle name or where she lives. Eli, (as someone who is a wee bit paranoid about internet safety, NOT as someone who is threatening anything) I suggest you keep it that way for her safety. "...because I had to drive "halfway across the country." And you guys FREAKED THE HELL OUT in the comments... Because SLC to Tahoe is apparently NOT halfway across the country. And it is offensive to anyone who has ever driven halfway across the country that I made such a claim... I exaggerate an exceptional amount on Stranger. I think somewhere around 10% of what I say is literally true." You are hysterical, Eli. TWO people out of THIRTEEN comments does not equal "freaking the hell out". Since I am proud to be one of the two, I will also point out that I think your estimate of "literal truth" is also a tad high. When you post about a political or religious topic that is near and dear to your heart, you might be giving us more than 10% truth, but in the grand scheme of things, I'm gonna have to say it's closer to 3%, which I know, in your mind, is EXACTLY the same thing as 10%. 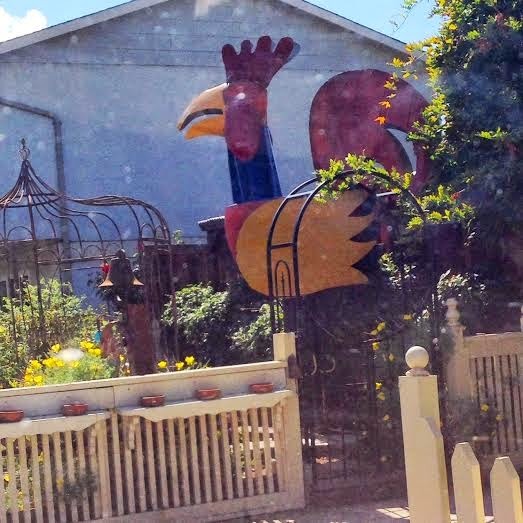 We love you, even if you're terrible at maths and distances and recognizing Beyonce the Giant Metal Chicken. I just wish you hadn't accused me of FREAKING THE HELL OUT. I can be a grammar nazi and a maths nazi, but I rarely Freak. The Hell. Out. Oh Emelle. I just love you. Hey, hey, he said comments, Facebook, and emails, so while we can't expect his math to be correct in how many people wrote him upset about his driving comparisons, it was at least more than two out of thirteen comments on his blog. Unless you've found a way to stalk his email and know he's lying about that . . . But that still leaves Facebook. One summer, my mother and I drove from Provo, stopped in Indiana, and ended up in Bar Harbor, Maine. That was a looooooong drive. Also remember, 90% of what he said is embellishment. Thank you, Eli. I love you, too. And Michelle, you have no idea. I could very well be the Q of Stalking. Or not. Like I said, you have no idea. And Lee, obvi. 90% of his idea of non-embellishment is still bad maths. Or something. I didn't say anything but having driven halfway to ¾ of the way across the country more times than I'd care to admit, my blood pressure did spike momentarily because really, Tahoe is practically next door when you consider all the other Ironman locales. Dude, where are you pointing that gun??? The Freudian imagery is a bit much. CATHIE SHOULD NOT SEE THAT PHOTO, ELI!!!! I wasn't going to say anything, but I noticed that too. LOL. Also...it's probably just the color of the picture and the angle, but it appears as though the only thing covering Hannah's top, is that fan. I saw some of those comments where people were freaking OUT about the distance thing. Do people really have nothing better to do?? Also, in that picture with Hannah, you kind of look like a serial killer. Just sayin. Agree. We know Eli exaggerates. Why get upset about an exaggeration about how far he had to travel? Please, PLEASE go read the pandemonium that is happening about the discontinuation of Betty Crocker Rainbow Chip frosting. People are describing how this is ruining ALL THE LIVES, and it is truly amazing. I'm just glad you finally explicitly stated that your stories are exaggerated...I've always thought that, but was so afraid they weren't. I will definitely sleep easier tonight.